If you ask me, this is pretty badass. Sure, it could be argued that the 5 Vita titles shown are rehashes, and I can't disagree. I can only add the caveat that it's still early in the handheld's life cycle, and there are many titles for the Vita that are not rehashes/ports etc. I just REALLY happen to love Ninja Gaiden, DOA, EDF and Muramasa. Speaking of Muramasa, if you've played the Wii game and enjoyed it (if you didn't you're dead inside, because the game is fantastic) (I'm only half serious), you should check out the upgraded port on the Vita if you ever get the chance. Yes, that's right, I said upgraded. The Vita is not only capable of playing a Wii game, it's capable of playing an upgraded version of a Wii game. The game POPS on the Vita screen. Simply gorgeous to look at and it now features fully customizable controls, so if you hated having to use up on the stick to jump, well, you can now change that. Personally, I still rock that method, but I also enabled the x button to act as a jump, so I have the best of both worlds. 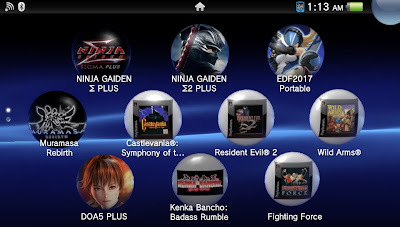 As for the other games on that screen, sure, they are PS1 games, but they are enhanced on the Vita and even if they weren't, you're still playing PS1 games on the go, as well as iterations of current console games, all on the same system with the best screen of any handheld ever. And I do mean ever. It's stunning how good games look on it.